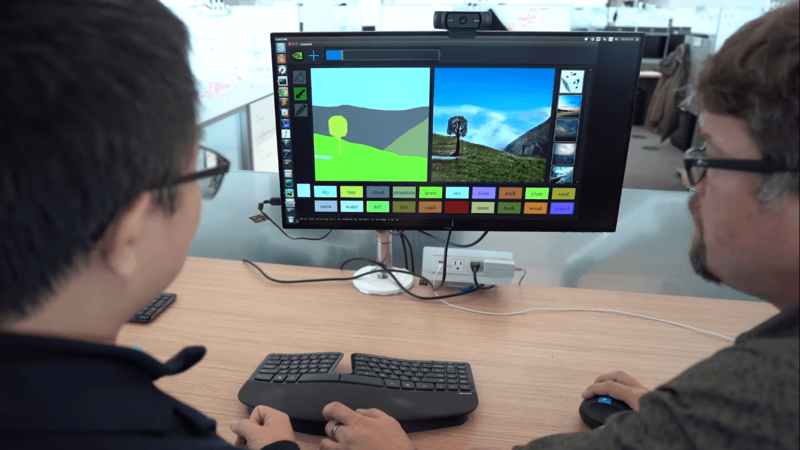 Today Nvidia has unveiled a stunning image creator at Nvidia GTC 2019.A new smart drawing app that uses a deep learning model can convert your simple sketches and doodles into realistic landscapes. The name of the app, GauGAN (named after post-Impressionist Paul Gauguin, and Generative Adversarial Networks), and it works like a simple digital painting tool.The app’s use of the generative adversarial networks (GANs) to develop its realistic images that gives users what Nvidia is calling a “smart paint brush”. It means someone can make a very basic outline of a scene before filling in their rough sketch with natural textures like grass, clouds, forests, or rocks.From there, GauGAN takes over, filling in the extra details to make your drawings more realistic. Nvidia’s latest drawing app is not just limited to nature scenes or landscapes, it can also be used to make buildings, roads, or even people.The app also allows artists to add style filters. It’s not clear yet, if GauGAN will ever be released for consumer use, but it is expected to be a particularly helpful tool for architects, urban planners, and even game developers.